Want to try going Keto but need to stick to a budget? Here are 5 tips to help you save big and win. If you have tried to lose weight or just scrolled through your Facebook feed in the last 3 years, you have probably heard of the Ketogenic Diet. It seems like everyone is doing it right now. In fact, it inspire one of the more common questions I receive. How can I save money while doing the Ketogenic Diet? Is there such thing as Keto on a Budget? The short answer is yes! You can save money (a lot of it) while one the Ketogenic diet. If you are considering going Keto but you are on a budget, keep reading. Because it does. What you put in your body is important. Be careful doing any diet just because one of your Facebook friends had good results. There are a lot of opinions out there, and I’m sure none of us is 100% correct. Diets are tricky. They promise results and quite often, they deliver. But in the process, we can end up doing very unhealthy things. If a diet is telling you to do something that doesn’t sit right with what you believe, take a second look. I say this specifically because some people may treat the Ketogenic diet as an excuse to eat tacos with tortillas made of cheese. Granted, that sounds amazing, and I will be first in line when you bring it to a potluck. But if you are constantly reaching for cheese, eggs, and meat, and you find you aren’t eating many vegetables, maybe you need to rethink how you are tackling Keto. 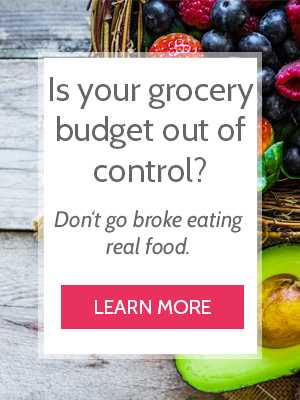 You may find you need to adjust your grocery budget. If you have a very generous budget already, perhaps you won’t. These tips will help you stick to that budget while you transition. If you are on a tight budget, give yourself a few weeks to adjust and find what works for you. When our family did the Cheapskate Whole30 Challenge, we had to increase our grocery budget significantly. However, we still saved a lot of money and kept our budget under national guidelines. There is no getting around the fact that rice, oatmeal, and wheat products are cheaper than quality meats and vegetables. However, using these tips will help every one of your dollars pack a powerful punch. Ideally, on the Ketogenic diet, you will not increase your intake of meat. Instead, you decrease your starchy carbohydrates (bread, grains, fruit, high-carb vegetables, etc.) and increase your intake of non-starchy vegetables and healthy fats. I think quality is very important here. While the Ketogenic diet has a lot of benefits, there is still a lot of research that points to the dangers of factory-farmed meat and animal products. If you eat a normal Standard American Diet (highly-processed carbs, sugary drinks, very few vegetables and plants), conventional animal products may be a huge improvement. However, if you already source sustainable, quality meat, eggs, and dairy products, going conventional may feel like you are taking a step back. This does not mean buying expensive cuts of meat or fancy cheeses. Instead, you can save a lot of money by sticking to the cheap cuts – bone-in, ground, skin-on, whole chickens, organ meats, etc. – and simply choosing organic or local. I shared how to afford grass-fed, pastured meat on a shoestring here. When our family did Whole30, one of our goals was to eat only quality, organic or local meat. The most we paid per pound of meat was $5 for local, grass-fed ground beef. Do some research, find local farms, ask for deals or bulk discounts and then keep shopping there. If your farmer knows they can rely on you as a regular customer, they are more likely to find good deals for you. If you are on a tight budget, some sources recommend that you choose organic, quality meat over organic produce. Ideally, we want both, but sometimes we have to choose one. I shared my favorite ways to save money on quality fruits and vegetables (and how we have gotten a ton for free!) here. Find which store around you has the best prices on the fruits and vegetables you can eat. Buy them there. I can get even better prices at Kroger if I find markdowns and clearance items in their produce section. I do not advocate shopping at a million stores a week in order to save a few dollars. However, if you can work a simple rhythm into your schedule so you can hit multiple stores, you may consistently save money. Example: We hit Aldi once a week on our way to the library. We stop at Costco over the weekend after church. Kroger is less than a mile from our house, so we might stop there once a week to look for markdowns. Every region is different, so take a little time to price shop and decide what you should buy where and how it might work in you schedule. Not only will buying frozen vegetables and berries save meal prep time, but it will also save you money. We love frozen vegetables. Even though fresh tastes better, not every meal needs to be a masterpeice. Sometimes we just need to EAT. Go here for my favorite ways to save money on quality dairy products. You could also call this a meal plan, but it’s not quite. More often, there are only one, maybe two people in a household following the Ketogenic diet. Meal plan for the rest of the house, but follow a food rhythm for yourself. Decide how you can work these into your week. Be willing to try something again or try something new if it doesn’t work the first time. We have all heard of meal prepping, but what does it look like on a specialized diet? Or what if you are prepping for 1-2 people out of a whole family? It looks a lot like prepping several simple meal elements. This saves time later and stops you from needing to reach for expensive Keto convenience foods. It also helps keep you from getting bored. Try preparing several items every week, you will have plenty of variety for many meals. One of my favorite cookbooks, Well Fed: Paleo Recipe for People Who Love to Eat, first taught me this simple but powerful process. It was a gamechanger (note: there are lots of keto-friendly or adaptable recipes in the book too!). In order to save money and eat healthy, you have to be willing to learn, get creative, and try new things. Going Keto can feel overwhelming, but if you’ve gotten this far, you’re probably ready for it. Use these tips to help you save money on your journey to healthier living! Got a Money-Saving Keto Tip? How do you save money on quality Ketogenic foods? Share your tips in the comments! If you found this post helpful, let us know! Leave a comment, share the post on Facebook (see the icon below) or Pinterest, and follow us on Instagram for more tips and frugal recipes. We also share cheap (like, actually cheap), real food menu plans every month for FREE with our email subscribers. Get the next one here. and design and Perfect content material.